One year ago, Onizuka Ichiro (Kitaoji Kinya), a detective of Shinjuku Higashi Police Precinct’s First Investigation Section, was stabbed by a criminal on his final case before retirement, and lost the function of his two legs. Although he is confined to a wheelchair, he is reemployed by the Tokyo Metropolitan Police Department and assigned to Shinjuku Higashi Police Precinct again as the head of its Judicial Section. Onizuka relies on his memories of the Showa and Heisei periods to investigate “untouched cases”. 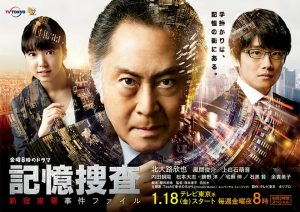 His subordinate is Toyama Saki (Kamishiraishi Mone), and Kami Keitaro (Kazama Shunsuke) is sent from the Tokyo Metropolitan Police Department’s First Investigative Division to be a police officer at the precinct.